"A family's Thanksgiving festivities are described using the numbers from ten to one." "When calamity stalks every step of the preparations for the Tappletons' Thanksgiving dinner, they realize that there is more to Thanksgiving than turkey and trimmings." "A simple description of how corn was discovered and used by the Indians and how it came to be an important food throughout the world." "Ten little Pilgrims and ten little Wampanoag boys and girls are getting ready for the harvest feast. 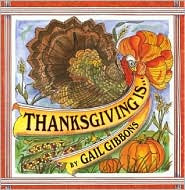 The simple, rhythmic text and autumn-colored illustrations are just right for sharing the history and fun of Thanksgiving with young children." "In a simple text of two or three lines per page, Gibbons presents clear and concise explanations of the American Thanksgiving." 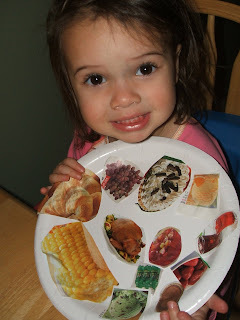 Idea#1: Paper Plate "Thanksgiving Dinner"
Read one of the book titles above and talk about some of the foods your family eats for Thanksgiving. Working together, look through the grocery store ads in the newspaper or the weekly coupon books for photos of food items that your family usually eats on Thanksgiving. Help them cut the photos out. It's okay if they want to cut out other things that you don't normally eat for Thanksgiving (Example: my daughter cut out donuts, chips, soda pop etc...)--it adds to the fun of the project. Then have them glue their items on a paper plate for a pretend Thanksgiving dinner. 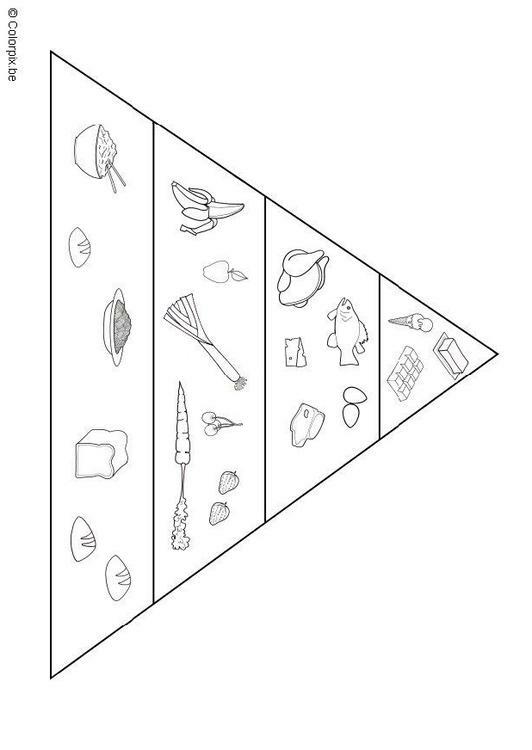 If you have an older child and want to extend the activity further, print off the food guide pyramid and discuss what food groups the items on their plate belong to. Talk about how we should eat foods from all the food groups and discuss what happens when we eat too much from only one food group. Read one of the book titles and discuss the importance of corn to the Native Indians and to the Pilgrims. Have fun making your own Indian Corn. There are two ways to do this activity. Either using paint and q-tips(version A) or using paper hole punch circles and glue(version B). My kids had fun doing it both ways. Print off the corn outline (I copied and pasted it into a word document so I could make it a little bigger). Squeeze 3 colors of tempra paint (brown, redish-orange, and yellow) on a paper plate. 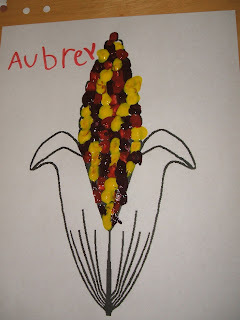 Using q-tips dot the kernels of corn with the various colors of paint. Remember, especially with the little ones, it is more about the process of exploring with different manipulatives etc.. than about the final product. She was enjoying the process of dotting the page with the q-tip, more than finishing filling in all her kernels. Print off the corn outline, as mentioned in version A. Using 3 colors of different construction paper (I used white, yellow, and brown) make a bunch of tiny hole punch circles using a hole puncher. Let your child squeeze some glue onto the corn printout and spread it around using a q-tip to cover all the kernels of the corn. Then let them sprinkle the hole punch circles over the glue. Shake off the loose dots. 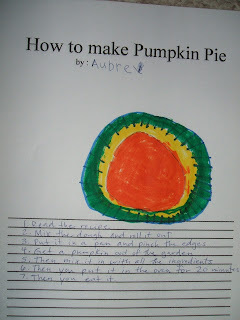 It is important to encourage prewriting skills for preschoolers. They can do this by drawing pictures and letting you label what is going on in their picture stories. For this activity you will need a piece of paper and some crayons. Title the paper, "How to make ______"(I did mine on the computer, but it is not necessary). 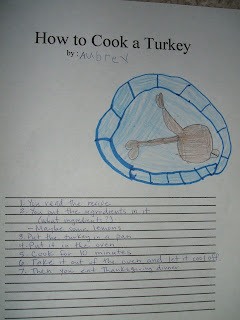 Read one of the book titles and discuss what your child's favorite food to eat is on Thanksgiving. Ask them to draw a picture of this food item on their paper and then dictate to you how to make it, as you write the steps. This can be very amusing. Probe them to give you details on what you do first, second, third. Ask them how long to cook it for etc...Usually there sense of time is totally off. This activity is more appropriate for age 3 and up. Cut uncooked corn on the cob into smaller chunks. Roll corn in a very thin amount of paint, coating all sides. Roll the corn across the paper to make a cool corn texture patterns. If you have some, use the little pronged corn handles to make it easier to dip and roll. Amy- I love your ideas. I especially love the corn in husk crafts (with paint and glue). I've just gathered the items, and we're about to start them. I'm gonna try both activities. Thank you so much for puting these wonderful ideas online for us. 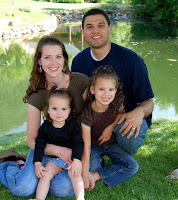 I too often am at a loss as to what to do with the kids. Your ideas are lifesavers. I'm a better mom because of you. The corn prints would be adorable on Thanksgiving invitations. Thank you for sharing! I cannot wait to try this with my little ones--Thanks! Wow, this is great! I jsut found your blog through The Crafty Crow. I'm loving your idea, off to explore some more. I'm going to feature your corn on the cob painting on the 17th. Is it ok to use your picture?